some days ago I came across some very thoughtful photo on facebook. 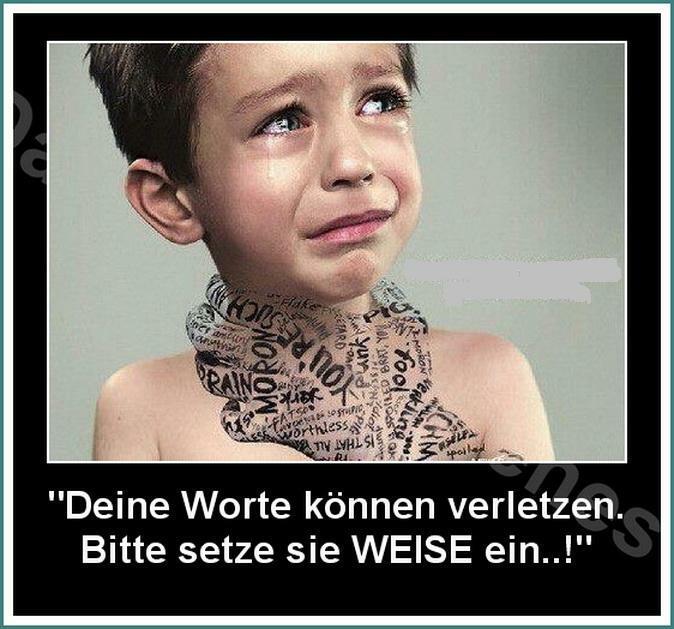 The text says: your words can hurt, please use them wisely. Well, the one side of the issue is that words can harm, can hurt even if you have a right to or a reason to do so. In that case the difficulty is to find the right balance between words and silence. The other side of the issue is to respect the differencies in being able to follow words at all. Children, foreign people who don´t speak your mother tongue, or people in a special mood, who don´t care at all in that moment what is said, are predisposed to feel not understood, to feel hurt or harm. don´t beat the other´s cheek with the truth like a wet washcloth. Communication, and that is a chance, uses words, the voice and nonverbal expression. Science says in an average of about: words 8 %, voice about 27 %, the rest is nonverbal expression. Of course you can also hurt and harm your counterpart by the voice or physically, nonverbally or by silence, that means not reacting at all. The chance we have, when being aware of this, is to listen to the different chanals we have to communicate. The chance we have is to communicate the rational aspects, what is “right or wrong” and to make sure that our words, our arguments also are digestible.